Today’s Nice Price or Crack Pipe Yamaha features a big single - so big in fact that you’ll also need a big leg just to kick it over. Let’s see if you get a big kick out of its price as well. If you grew up in the U.S. you no doubtably had a copy of Gilbert Stuart’s unfinished portrait of George Washington on the wall of your elementary school classroom, and if you’re anything like me, it probably pissed you off. I mean, they’ve had 200 years to finish it! There was a similar air of lack of interest in bringing yesterday’s custom rotary 1983 Toyota Corolla wagon to completion, what with the small litany of fixes it required. That, along with an asking price just above eff-it level conspired to drop that humming Corolla in a narrow but fatal 53% Crack Pipe loss. Moral folks? Sweat the small stuff. When it comes to cars and cylinder count it always seems that it’s the more the merrier, and we hold a special place in our hearts for anything with a dozen or more pots, so rare and lovely they tend to be. When it comes to bikes however, there’s a certain appeal to those with fewer cylinders, especially when those few are really big boppers. 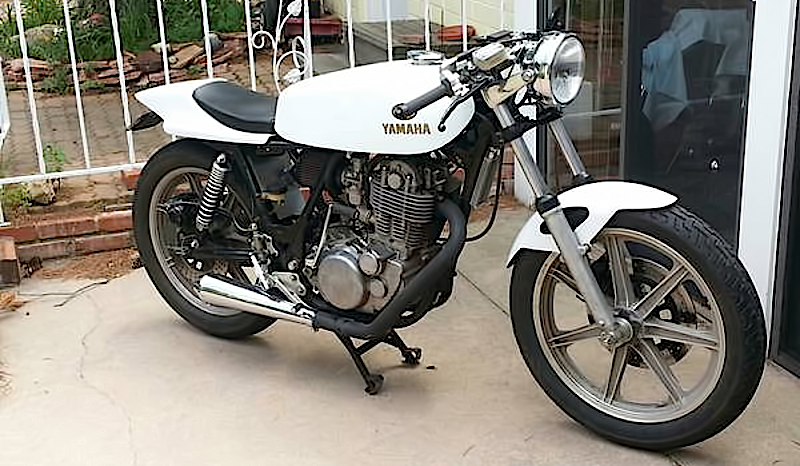 This 1978 Yamaha SR500 is just such a thumper, sporting an air-cooled single of gargantuan proportions. The name derives from the factory displacement, which was 499-cc, but this former track ride rocks a big-bore kit elevating that to a heady 540-cc. The SR500 was Yamaha’s take on a traditional British bike and was marketed in the U.S. only from 1978 through ’81. The engine is a SOHC 2-valve with a dry sump - the frame downtubes serving as the reservoir, and it came without the luxury of and electric starter. Nope, you’re the starter. One of the unique features of the bike is the sight glass on the cylinder head which lets you judge piston position before attempting to kick over the beast. A decompressor lever on the handlebars ensured you could get the piston in position in the first place. This one eschews the upright UJM look and riding position for a café racer style befitting its apparent former life as, well, a café racer. Clip-ons and a monoposto saddle give the bike a lower, longer appearance, while the black and chrome trumpet pipe looks all business on the side. The racer’s edge here includes a safety wired set up ensuring the big thumper won’t shake the bike’s nuts loose, only yours, as well as a hot cam, Mikuni carb and a battery eliminator kit. That has all been complimented with road lights and a number plate so the bike is streetable. The SR500 is a unique bike. It’s not the ultimate canyon carver, and in fact they can be a bit ungainly at full chat. However, like an early 911, it’s a ride that takes patience to learn and is rewarding to master. To master this one, all you’d need is $2,900 and a stout leg with which to start it. What’s your take on this SR500, is its $2,900 price a fair tab at this café? Or, for that price is this a single that wouldn’t get a double take? Colorado Springs Craigslist, or go here if the ad disappears.